The dove tree will surely become a focal point in your garden. This deciduous tree is covered in spring with red flowers that are framed by large white bracts. When the wind hits the bracts, they can sway and flutter, inspiring names like dove tree, handkerchief tree or ghost tree. The Royal Horticultural Society gave their Award of Garden Merit to this tree. This is the only species in the genus and is designated as Davidia involucrata. There are two different varieties: D. involucrata var. vilmoriniana and D. involucrata var. involucrata. The name Davidia is in honor of a French missionary named Father Armand David. Botanists place this genus in either the Nyssaceae (tupelo), Cornaceae (dogwood) or Davidaceae family. The common names all refer to the blossoms. 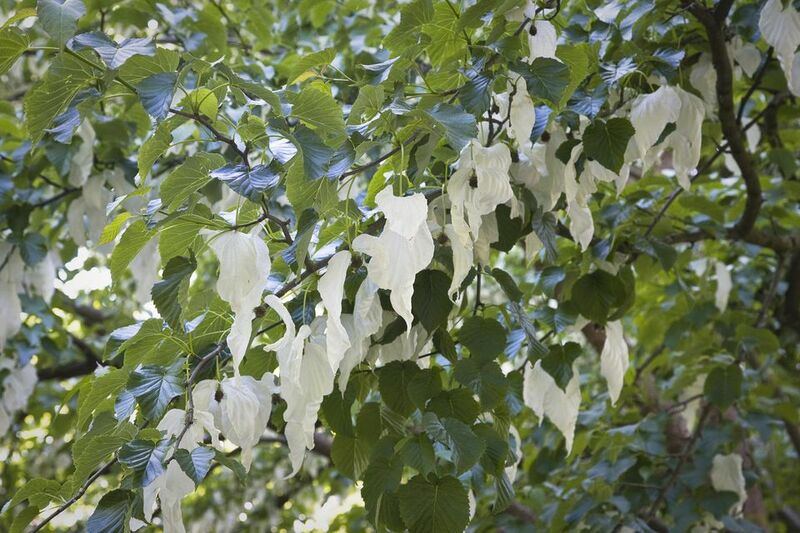 It can be called dove tree, pocket handkerchief tree, laundry tree, ghost tree or handkerchief tree. You will be able to plant this tree if you live in USDA Zones 6-8. The vilmoriniana is more tolerant of cold and can be grown in Zone 5. The native region of the dove tree is found in southwestern China. This tree will reach a size of 20-60' tall and 20-40' wide. It starts out with a pyramidal shape and can become rounded at maturity. This tree can be planted in a location with full sun or partial shade. The cordate leaves are 2-6" long and look quite similar to those of the linden trees They may change to orange or red before they drop. Though it appears that this tree has two very large white petals, they are actually bracts. The true flowers with reddish-purple anthers are clustered into a ball between the hanging bracts. One bract is usually 3-4" long and the other will be 6-7" long. Nuts form after pollination. They start out green and become purple as they mature. Use this as a specimen tree to draw the eye to the desired location in your garden. If you like variegated leaves, look for the 'Shibamichi Variegated', 'Platt's Variegated', 'Aya Nishiki' and 'Lady Sunshine' cultivars. 'Crimson Spring' features leaves that are burgundy colored when they first unfurl, gradually becoming green over time. Pick a location in your yard that has good drainage. Moist soil is best. Propagation can be carried out through seed germination or by taking hardwood cuttings. The tree is more likely to bloom sooner if it was created from a cutting. This tree will not usually need pruning besides the general maintenance of removing any branches that have become dead, diseased or damaged. There are not typically any pest or disease problems with this tree.